In late 2013, I was interviewed by two editors of Inquiring Mind, the semiannual Journal of the Vipassana Community. The interview will be published in the Spring 2014 issue, and is reprinted here with permission. After many years in the U.S. military followed by the Foreign Service, Ann Wright is now a peace activist whose pivotal resignation from the U.S. State Department was influenced by Buddhist teachings. She is a unique voice on issues of war and peace. Wright served 13 years of active duty in the U.S. Army and 16 years in the Army Reserves, rising to the rank of colonel. After the army, she served 16 years in the State Department in countries from Uzbekistan to Grenada and as Deputy Chief of Mission (Deputy Ambassador) at the U.S. embassies in Afghanistan, Sierra Leone, Micronesia and Mongolia. In March 2003 she was one of three federal government employees, all State Department officials, who resigned in protest against the war in Iraq. For the past 10 years, Wright has courageously spoken out on a wide variety of issues including nuclear power and weapons, Gaza, torture, indefinite incarceration, Guantanamo Prison and assassin drones. Wright's activism, including talks, international tours and civil disobedience, has been of particular power in the peace movement. Fellow activists bolstered by her advocacy can assert, as she puts it, "Here's somebody that's spent a lot of years of her life in the military and the diplomatic corps and is now willing to speak about peace and challenge the rationale that America needs to have war in order to be the dominant power in the world." 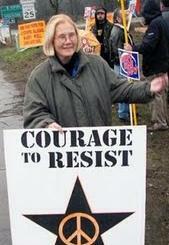 Wright works with organizations such as Veterans for Peace, Code Pink: Women for Peace, and Peace Action. But drawing on her background both in the military and in the U.S. diplomatic corps, she speaks as an independent voice. Inquiring Mind editors Alan Senauke and Barbara Gates interviewed Ann Wright via Skype in November 2013. ANN WRIGHT: At the time of my resignation I was Deputy Chief of Mission of the U.S. Embassy in Mongolia. I had begun to study Buddhist texts in order to better understand the spiritual underpinnings of Mongolian society. When I arrived in Mongolia, it was 10 years after the country had come out of the Soviet sphere. Buddhists were digging up relics that their families had buried decades earlier when the Soviets destroyed Buddhist temples. I had not realized before I arrived in Mongolia the extent that Buddhism had been a part of the life of the country prior to the Soviet takeover in 1917. Before the twentieth century, the interchange of Buddhist thought between Mongolia and Tibet was substantial; in fact, the term Dalai Lama is a Mongolian phrase meaning "Ocean of Wisdom." While most lamas and nuns were killed during the Soviet era, in the 15 years since the Soviets loosened their hold on the country, many Mongolians were studying the long-prohibited religion; new temples and strong Buddhist medicine and art schools were established. Ulan Bator, the capital city and where I lived, was one of the centers for Tibetan medicine. Whenever I had a cold or flu I would go to a temple pharmacy to see what the doctors there would recommend, and in my conversations with the monks and the Mongolian civilians who helped run the pharmacy, I learned about different aspects of Buddhism. I also took an evening class on Buddhism and did the recommended readings. Probably not surprising to most Buddhists, it seemed like every time I would open up a booklet in one series of readings, there would be something that was like, oh, my goodness, how incredible that this particular reading is speaking to me. AW: Various Buddhist tracts had great relevance for me during my internal debate on how to handle my policy disagreements with the Bush administration. One commentary reminded me that all actions have consequences, that nations, like individuals, ultimately are held accountable for their actions. In particular, the Dalai Lama's September 2002 remarks in his "Commemoration of the First Anniversary of September 11, 2001" were important in my deliberations on Iraq and even more relevant in our approach to the Global War on Terrorism. The Dalai Lama said, "Conflicts do not arise out of the blue. They occur as a result of causes and conditions, many of which are within the antagonists' control. This is where leadership is important. Terrorism cannot be overcome by the use of force, because it does not address the complex underlying problems. In fact, the use of force may not only fail to solve the problems, it may exacerbate them; it frequently leaves destruction and suffering in its wake." AW: Yes, the cause-and-effect issue that the Bush administration dared not acknowledge. The Dalai Lama identified that the United States must look to the reasons why bin Laden and his network were bringing violence to America. After Gulf War I, bin Laden had announced to the world why he was angry with America: U.S. military bases left in Saudi Arabia on the "holy land of Islam" and U.S. bias toward Israel in the Israeli-Palestinian conflict. These are causes that are still unacknowledged by the U.S. government as reasons why people continue to harm Americans and "U.S. interests." It is a blind spot in the American government's look at the world, and tragically I'm afraid that it's a blind spot in the psyche of many Americans that we don't recognize what our government does that causes such anger around the world and causes some people to take violent and lethal action against Americans. I do believe America had to respond in some manner to the violent methods used by al-Qaeda. The destruction of the World Trade Towers, part of the Pentagon, the bombing of the USS Cole, the bombing of two U.S. embassies in East Africa, and the bombing of the U.S. Air Force Kobar Towers in Saudi Arabia could not go without a response. That said, until the U.S. really acknowledges that America's policies -- particularly the invasion and occupation of countries -- cause anger in the world, and changes its manner of interacting in the world, I'm afraid that we're in for a much longer period of reprisals than the 12 years we've suffered through already. IM: As a member of the armed forces and as a diplomat and now as a politically engaged civilian, you've indicated that you believe it's sometimes appropriate to draw on military force. When is that? IM: Wasn't there a United Nations force in Rwanda? AW: Yes, there was a small United Nations force in Rwanda. In fact, the Canadian general who was in charge of that force requested authorization from the UN Security Council to use force to end the genocide but was denied that authorization. He has post-traumatic stress and has attempted suicide because of his regret that he did not go ahead and act decisively, using that small force to attempt at the very beginning to stop the massacre. He now feels that he should have gone ahead and used his small military force anyway and then dealt with the aftermath of possibly getting fired by the UN for not following orders. He is a strong supporter of the Genocide Intervention Network. I still feel the world is better off when unlawful, brutal actions against civilian populations are stopped, and generally, the fastest, most effective way to end these brutal actions is by military operations -- operations which unfortunately also may result in loss of life in the civilian community. IM: Since your resignation from the State Department in opposition to the Iraq War, as a responsible and sometimes outraged citizen, you have been traveling around the world articulating your views as a critic of the policies of the administrations on various international issues, including the use of assassin drones. From the point of view of Buddhist commitment to Right Action, to awareness of, and a sense of responsibility for, the consequences of one's actions, the use of drones is particularly reprehensible. AW: The issue of assassin drones has been a big focus in my work over the last two years. I've made trips to Pakistan, Afghanistan and Yemen talking with the families of victims of drone strikes and speaking about my concerns on U.S. foreign policy. It's important to travel to those countries to let citizens there know there are millions of Americans that totally disagree with the Obama Administration on the use of assassin drones. The U.S. now has the ability for a person at Creech Air Force Base in Nevada to sit in a very comfortable chair and, with a touch on a computer, assassinate people halfway around the world. Little kids are learning killing technology from the time they are four or five years old. Computer games are teaching our society to kill and to be immune from the emotional and spiritual effects of remote-controlled killing. People on a screen are not human beings, our computer games say. Every Tuesday, known in Washington as "Terror Tuesday," the president gets a list of people, generally in countries with which the U.S. is NOT at war, that the 17 intelligence agencies of the United States have identified as having done something against the United States for which they should die without judicial process. The president looks at brief narratives describing what each person has done and then makes a checkmark beside the name of each person he has decided should be extra-judicially killed. It's not George Bush, but Barack Obama, a constitutional lawyer no less, who as President of the United States has assumed the role of prosecutor, judge and executioner -- an unlawful assumption of powers, in my opinion. Americans, as a society, think we are good and generous and that we respect human rights. And yet we are allowing our government to use this type of assassination technology to destroy people half a world away. That's why I have felt compelled to try to educate more people in the United States and in other parts of the world about what's going on, because certainly the technology is going from country to country to country. Over 80 countries now have some kind of military drone. Most of them are not weaponized yet. But it's just the next step to put weapons on their drones and then perhaps even use them on their own countrymen and women as the United States has done. The United States has killed four American citizens who were in Yemen. IM: Then there's the blowback, the extent to which this technology, which is immediately accessible to everybody, can easily be used against us by others. That's cause and effect. Or you might call it karma. AW: Yes, the whole issue of karma is one of the things that has been a motivating factor for me. What goes around comes around. What we, the United States, are doing to the world is coming back to haunt us. The Buddhist readings I did while in Mongolia certainly helped me see this. At many talks that I give, one of the questions that I get from the audience is, "Why did it take you so long to resign from the State Department?" I spent virtually all of my adult life being a part of that system and rationalizing what I did in the government. I didn't agree with all of the policies of the eight presidential administrations I worked under and I held my nose to plenty of them. I found ways to work in areas where I didn't feel like I was harming anybody. But the bottom line was, I was still part of a system that was doing bad things to people all over the world. And yet I didn't have the moral courage to say, "I will resign because I disagree with so many of these policies." When you really look at how many people ever resigned from our government, there are very few -- only three of us who resigned over the Iraq War, and others who resigned over the Vietnam War and the Balkan crisis. I never would have imagined that the readings I did in Buddhism, and particularly on karma, would have had such an influence in making my decision to resign and led me to advocate for peace and justice in the world. IM: Thank you. It's important for people to know your journey. Many people come to Buddhism as they grapple with suffering in their lives. But these teachings spoke to you at the exact intersection of your personal life and the urgent issues of society. And you were moved beyond contemplation to action. That's a valuable lesson for us. "Karma of Dissent" is reprinted by permission from Inquiring Mind: The Semiannual Journal of the Vipassana Community, Vol. 30, No. 2 (Spring 2014). 2014 by Inquiring Mind www.inquiringmind.com.